Charybdis’s last Listener was three years ago with No 4310 Net Book Agreement and its theme of The L-Shaped Room. Towards the end of my blog for that puzzle, I had the words “I breathed a sigh of relief that my all-correct run for this year was still intact.” Well it wasn’t! It was down to my misunderstanding of how the “net” of the rooms was to be drawn. Hopefully, this week’s puzzle wouldn’t give me a problem. As I read the preamble, it seemed possible that it would. My heart must’ve skipped a couple of beats as I was told how we had to identify who Mark, Francis and Robert were together with some of their relations, find two proverbs, “uncover” one, amend the other, find a title, and finish it all off with some highlighting. There was an isolated cell near the bottom right corner, and that would obviously need filling, and 15 clues needed a letter to be restored. I started off fairly well, with 7ac RENEGER (good old Magritte helping) and a flurry of down entries in the top right corner. Working my way down to the bottom right soon had me see •A•GHT•• unclued at 28ac, and a daughter seemed to be one of the relations we had to identify. The top left and then the bottom left were soon looking healthy, and it didn’t take too long to see TRUTH IS (28ac) STRANGER (column 4) THAN FICTION (row 9). The restored letters meanwhile were spelling out Twain and Bacon (Mark and Francis), but it needed me to solve all the clues before Wyatt popped up. Robert Wyatt then needed some googling to find his album Ruth is Stranger than Richard. I didn’t get to the final highlighting by trying to work out what went into the isolated square. My eye was casually looking at the finished grid and saw CAR PARK in row 3. Looking in the row above it, LEICESTER made me break out in a broad smile, what I have recently started calling my BGM — Big Grin Moment. 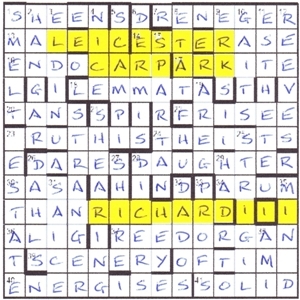 Of course, slotting an I into the isolated square revealed RICHARD III, whose bones were recently discovered beneath a car park in Leicester, although I’m pretty sure they didn’t use a bulldozer to uncover them! What a wonderfully roundabout journey it was. Great fun, thanks Charybdis. This entry was posted on 6 October 2017 at 4:00 pm	and is filed under Solving Blogs. Tagged: Charybdis, Hide-and-Seek. You can follow any responses to this entry through the RSS 2.0 feed. You can leave a response, or trackback from your own site. Your lovely little digger gave us a BGM!